On the morning of Tuesday, 21 December 1920 Claude Tozer, well-known North Shore GP and recently selected test cricketer paid a house call on Mrs Dorothy Mort of Lindfield, to announce the end their adulterous love affair - Tozer was a bachelor, Mort was married with children. 'Lady?s companion' Florence Fizzelle, elsewhere in the house at the time, later testified that ten minutes into the consultation she heard gunshots from the drawing room. Mrs Mort assured her through the locked drawing room doors that all was well, and asked for a glass of iced water. After ten minutes more shots were heard. Sometime during the day Mort retired to her bedroom, leaving the drawing room locked behind her. Eventually Fizzelle forced her way into the bedroom, where she found Mort covered in blood, with a gunshot wound to her breast, and apparently under the influence of a narcotic. A doctor and policeman were summoned. They found Tozer dead, in the drawing room, shot in the back of the head, in the temple and in the chest. His vest had been rebuttoned over the chest wound. A Colt pistol, a bloodstained kimono and a bottle of laudanum were also found in the room. Dorothy Mort recovered and was charged with murder, and subsequently convicted. Years later a recently released Long Bay inmate told Truth that she had found Mrs Mort, who looked after the prison library, to be 'a very private person ... She held herself very aloof from the others. She was spoken of by the others as a very educated person ... I heard that she is very delicate. 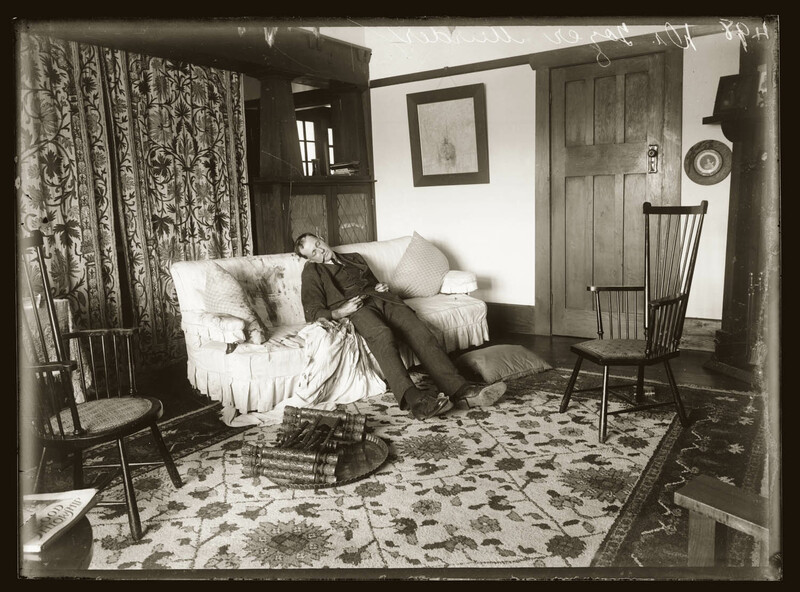 The photograph seen here (which also displays Mrs Mort's fashionable Arts and Crafts styled drawing room to good advantage) appeared, unmodified, in a detailed report of the murder in Truth of March 20 1921, and also in the Daily Telegraph.